Baked naans are simply superb! When I were going to bake them, I were not sure they would bake right or not but they baked perfect. I followed FKF recipe but with a little change. I didn’t use milk powder because I didn’t have at that moment. I also replace butter with desi ghee. 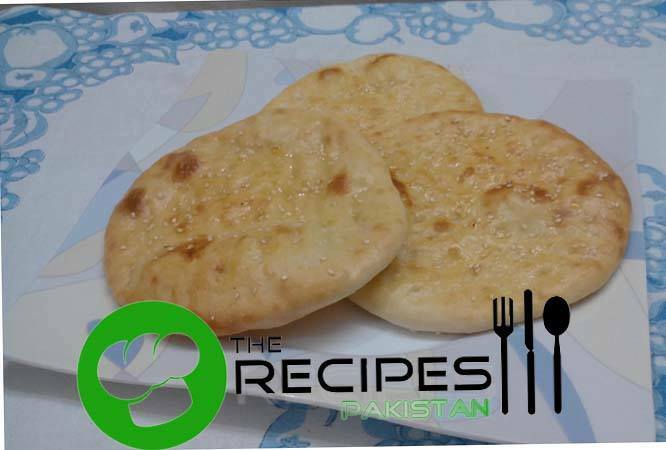 Naan are good to serve with many dishes, I served with Nihari. Sift the flour, then add salt, sugar, yeast, baking powder and milk powder. Stir together to combine. Make a well in the center and add the oil plus HALF the egg. Mix it into the flour, then gradually add the warm water & milk and combine until dough is very soft and quite sticky. If it gets too sticky, just touch a bit of oil and knead it, then put the dough in an oiled bowl and cover. Let it rest until it doubles in volume. Turn the dough out on a floured surface and divide into 3-4 balls (depending on how big you want the naans, I made in small size do I divided dough in 4 balls). Let the balls rest for 10 minutes. Again, the dough will be quite sticky so just sprinkle a bit of flour on them and on the work surface. Place the naans on a greased baking tray, then brush the tops with the remaining half egg. Sprinkle some sesame seeds on them if you want. Bake for about 4-5 minutes (turn on the oven grill along with the oven and the naans need to be baked in the middle rack of the oven to get equal heating from all sides. ), or until the naans are spotted with brown. Remove and brush with some melted butter. Keep covered until time of serving. Bake 4-5 minutes at high temperature to get done, baking them any longer than this makes them hard/over-cooked. Thank you for your recipes. They are delicious. I want to make naans tomorrow for saturday. Would make the dough store in frdge overnight, bring to room temperature and bake saturday. Be ok. I do not have dried milk powder. Will the naans be ok anyway. I have successfully baked nans in a multicooker before so intend to use tgat. Hi Sandra, yes you can skip dried milk powder.